So, you are looking for the Best recumbent exercise bike, have a quick look at Marcy ME 709 Recumbent Exercise Bike. If you want an easy way to shed unwanted weight and increase cardiovascular endurance without sacrificing precious floor space, then Marcy ME 709 Recumbent Exercise Bike is the answer. With this cardio training equipment, you will be benefited from similar type exercise features that are typically offered on larger and more expensive exercise bikes. 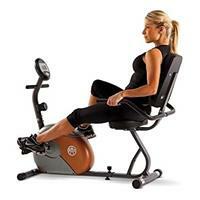 This recumbent exercise bike was built with a compact design that conveniently fits into the smallest workout spaces. With Marcy ME 709 Recumbent Exercise Bike you can shape, firm and tone your physique and increase your body’s cardiovascular endurance while burning calories and losing weight. It Includes a manufacturer’s 2-year limited warranty. Only domestic Shipping is available. Item can be shipped within the U.S.
Marcy ME 709 Recumbent Exercise Bike reduce fat, increase stamina, and improve cardiovascular performance. This exercise machine features 8 preset levels of resistance in a comfortable recumbent seating position. This bike has steel tubing: 2-inch 14-gauge Molded ABS with 2-tone painted finish. The durable powder-coat finish on frame Step-through frame design is also available for easy entry/exit. This bike has a comfortable seating position and smooth magnetic resistance. Computer display includes time, distance and calories burned. It has speed adjustable high-density foam seat Contoured foam-covered handlebars Pedals are weighted and counter-balanced with adjustment straps. Again it has wheels for easy transport Weight capacity: 300 lbs. Some assembly required and the assembled dimensions are 55.5L x 25W x 37.5H inches About Impex Fitness Established in 1980, Impex Fitness is on the front lines of innovation in today’s health marketplace. They specialize in home fitness machine style equipment that appeals to the whole family and offers a complete exercise experience. The quality of Marcy ME 709 Recumbent Exercise Bikeis very good and its price is also low.